As part of BFREE’s initiative to enhance field experiences for student groups, members of the education committee have designed field exercises focused on different aspects of tropical ecology, including a small mammals biodiversity survey and this study, an investigation of the timing of fruit production in canopy trees. As fruit is a major food resource for numerous seed dispersing birds and mammals, timing of fruiting is critical to understanding the complex relationship between plants and animals in tropical communities. This study will also familiarize students to tropical tree identification and tropical plant communities. This study and the small mammal survey are located in two plots, a managed cacao plantation and an unmanaged forest habitat. 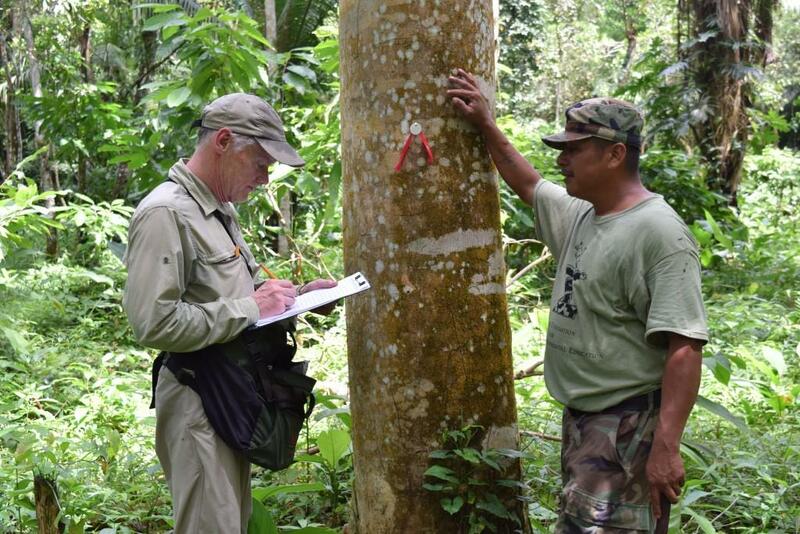 These studies strive to produce a better understanding of the ecological differences between cacao and unmanaged forest habitats. Because these projects are focused on the comparison of agroecosystems to natural habitats, they will also serve as a good example to students of the importance of integrating human needs and concerns in the disciplines of ecology and conservation biology. Principal Ecological Questions Addressed: Do forest trees at BFREE show seasonal fruiting pattern? Do differences in tree diversity and fruiting phenology exist between the rustic cacao and the nearby tropical broadleaf forest habitat. 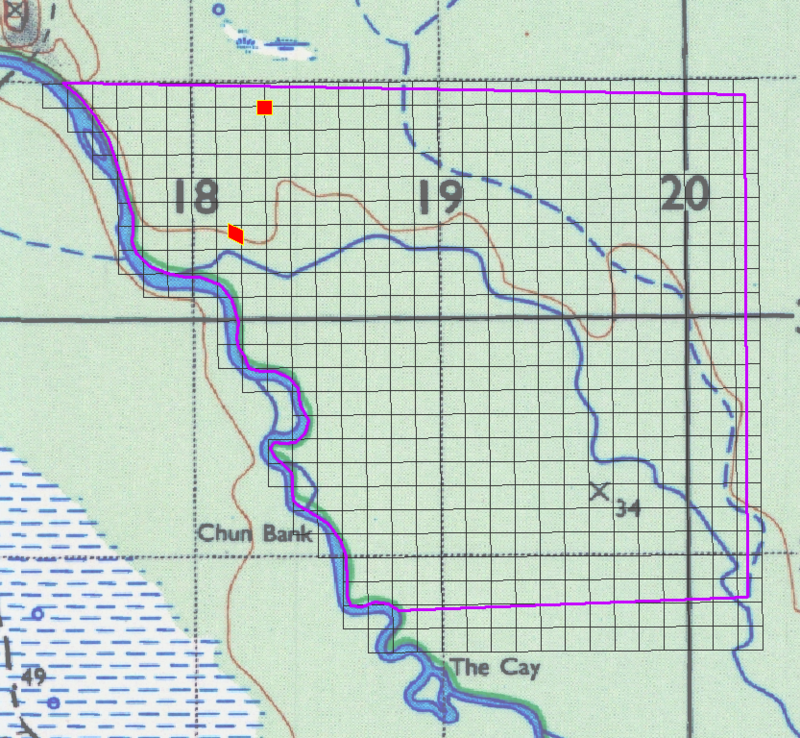 BFREE map (property outline in purple) with location of trapping grids indicated in red. 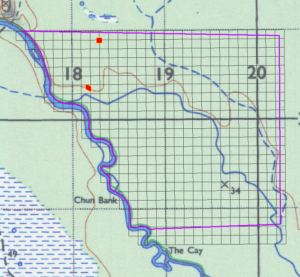 Cacao grid is located approximately 0.5 km north of the forest grid. 2. Be familiar with observation techniques for determination of tropical tree flowering and fruiting. 3. Be able to understand the ecological ramifications of fruit production and dispersal systems in tropical forest communities. 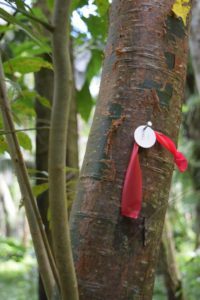 Each plot takes approximately 2 hours to survey the tagged trees for fruit. One 2-hour class period can be used for analysis and interpretation of the results. Alternatively, the analysis and interpretation could be assigned as homework. Dr. Stewart Skeate and Mr. Sipriano Canti placing initial tags on trees in 2016. Athayde, E. A., & Morellato, L. P. C. 2014. Anthropogenic edges, isolation and the flowering time and fruit set of Anadenanthera peregrina, a cerrado savanna tree. International Journal of Biometeorology, 58(4), 443-454. Brewer, S. W., & Rejmánek, M. 1999. Small rodents as significant dispersers of tree seeds in a neotropical forest. Journal of Vegetation Science, 10(2), 165–174. Corlett, R. T., & Lafrankie Jr, J. V. 1998. Potential impacts of climate change on tropical Asian forests through an influence on phenology. Climatic Change, 39(2), 439-453. Fleming, T. H., & Heithaus, E. R. 1981. Frugivorous bats, seed shadows, and the structure of tropical forests. Biotropica, 13(2), 45–53. Frankie, G. W., Baker, H. G., & Opler, P. A. 1974. Comparative phenological studies of trees in tropical wet and dry forests in the lowlands of Costa Rica. Journal of Ecology, 62(3), 881–919. Galetti, M., Keuroghlian, A., Hanada, L. and Morato, M. I. 2001, Frugivory and seed dispersal by the lowland Tapir (Tapirus terrestris) in southeast Brazil. Biotropica, 33: 723–726. Haugaasen, J. M. T., Haugaasen, T., Peres, C. A., Gribel, R., & Wegge, P. 2010. Seed dispersal of the Brazil nut tree (Bertholletia excelsa) by scatter-hoarding rodents in a central Amazonian forest. Journal of Tropical Ecology, 26(3), 251-262. Hirsch, B. T., Kays, R., & Jansen, P. A. (2012). A telemetric thread tag for tracking seed dispersal by scatter-hoarding rodents. Plant Ecology, 213(6), 933-943. Howe, H. F. 1977. Bird Activity and seed dispersal of a tropical wet forest tree. Ecology, 58(3), 539–550. Howe, H.F. 1984. Implications of seed dispersal by animals for tropical reserve management, Biological Conservation, 30(3), 261-281. Howe H.F. 1986. Seed Dispersal by Fruit-Eating Birds and Mammals, In Seed Dispersal, edited by David R. Murray, Academic Press, San Diego, 1986, Pages 123-189. Howe, H. F., & Smallwood, J. 1982. Ecology of seed dispersal. Annual Review of Ecology and Systematics, 13, 201–228. Khorsand Rosa, R., Barbosa, R. I., & Koptur, S. 2013. How do habitat and climate variation affect phenology of the Amazonian palm, Mauritia flexuosa? Journal of Tropical Ecology, 29(3), 255-259. Levey, D. J. 1988. Spatial and Temporal variation in Costa Rican fruit and fruit-eating bird abundance. Ecological Monographs, 58(4), 251–269. Opler, P. A., Frankie, G. W., & Baker, H. G. 1980. Comparative phenological studies of treelet and shrub species in tropical wet and dry forests in the lowlands of Costa Rica. Journal of Ecology, 68(1), 167–188. Van Schaik, C. P., Terborgh, J. W., & Wright, S. J. 1993. The Phenology of tropical forests: adaptive significance and consequences for primary consumers. Annual Review of Ecology and Systematics, 24, 353–377. Villaseñor-Sánchez, E. I., Dirzo, R., & Renton, K. 2010. Importance of the lilac-crowned parrot in pre-dispersal seed predation of Astronium graveolens in a Mexican tropical dry forest. Journal of Tropical Ecology, 26(2), 227-236. Wheelwright, N. T. 1986. A seven-year study of individual variation in fruit production in tropical bird-dispersed tree species in the family Lauraceae. In Frugivores and Seed Dispersal 19-35. Springer Netherlands. Wheelwright, N. T., Haber, W. A., Murray, K. G., & Guindon, C. 1984. Tropical fruit-eating birds and their food plants: A survey of a Costa Rican lower montane forest. Biotropica, 16(3), 173–192.